When you look at someone what do you see? A man in a shiny red Mercedes convertible is an arrogant executive. A young tattooed guy in a hoodie buying cigarettes at 7-11 is trouble. A girl standing by the pool at a posh hotel with a diamond studded left hand grew up as daddy's little rich girl. Here's a lesson in things aren't always what you think. One early morning I was standing by the pool with one of my friends at the Four Seasons L.A. drinking a double shot iced espresso. It was one of those perfect bright blue only-in-Hollywood-movies kind of mornings as the palm trees swayed in the breeze, cooling us after our early morning workout in the rooftop gym. It was idyllic. My friend turned to me and said "Seriously, we are the luckiest girls." Absolutely. It would be easy to assume that this was my life. That I grew up being pushed in a pram by a nanny, and played lacrosse and went abroad for summers. If you looked at me that day by the pool, a successful celebrity interviewer working for a Fortune 500 company, you would never guess that this was not the way things started out. I grew up in a trailer park with my teenage mom and her parents. 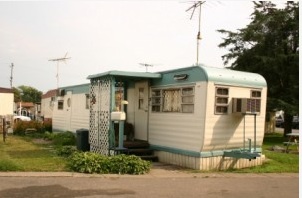 When L. and I are driving and we pass by a trailer park I will point to it and say "I lived in a trailer park." L. always shakes his head at me and says "Could you please stop doing that?" But I did. I grew up in a trailer park in Western Massachusetts just outside Westover Air Force Base. In fact, the trailer park was so close to Westover that when the behemoth C5 jets took off over our trailer, the vibrations would cause objects to fall off shelves and tables. My smart grandfather knew just how to fix this and had you visited us during the trailer park years you would have found just about everything duct-taped down. Even my crib. Apparently the vibrations would even cause my crib to inch across the floor which completely flummoxed my grandparents when they would come check on me after my mid-day nap and my crib would be in the middle of the room. I learned much later that my very religious grandmother thought it was the angels who were protecting me that moved my crib away from the drafty windows. It wasn't until my grandmother was diapering me one afternoon and felt us gravitating away from the wall that they realized that this was not something supernatural. That was the plan. Didn't happen. My mom got her nursing degree, met a great guy and got married. I got a shiny new dad who adopted me and we moved out of the trailer park. I graduated from high school (not pregnant! ), graduated from college (not pregnant! ), more education (not pregnant! ), met an amazing guy, L., got married (not pregnant! ), worked crazy hours as an intern (11 p.m.-7 a.m.) in a hospital so I could work 9 a.m. - 5 p.m. at a television station as an intern (I have no idea how I did that for so long), got a job working for the most famous software company in the world working alongside the smartest people on the planet. Then one day I found myself sitting across from Brad Pitt and George Clooney at the Hotel du Cap in Antibes, in the South of France. I was definitely not in a trailer park anymore. I know living in a trailer park is something people don't aspire to, but it wasn't so bad. It was a small friendly community and as an only child I was free to spend my summer days roaming the trailer park and invariably someone would be available to play with me or feed me lunch. I remember sitting on a neighbor's front step and eating a Fluffer-nutter sandwich and thinking what a lucky little girl I was. Two of my earliest best friends were the gay couple who lived two trailers down from us. My grandfather used to call them 'Those Happy Boys' which was definitely a form of endearment from such a gruff man as my grandfather was. It was home. My grandparents and mom felt safe. The most important thing is that I was loved and I knew that. I think back now and I was embarrassed for so many years about my trailer park past. But suddenly one day I revealed my past on-camera. During my interview with Hilary Swank for "The Reaper", we actually talked about our shared trailer park past. We even high-fived with Hilary declaring "Trailer Park girl unite!" It was a little scary to reveal on-camera but also freeing. It's easy to label others because as humans it makes us feel comfortable to put people in boxes, to know what to expect. But the thing is--people don't fit well in boxes. Things are fluid. You can't tell by looking at someone what their story is. They may have grown up summering at the Hamptons or in a refugee camp or even a trailer park. What matters though is who they are now. What they survived is their story and you may never knew exactly what makes someone behave as they do. Bonus lesson #3a: You are not your past. Whatever your childhood was like, that is not you. You have the moment you are in right now. You can rise above anything. Whatever defined you as a kid does not define you now. Move on. So if you see me duct-taping a plant holder to the trellis outside, you'll understand why. And wave as you go by. We're a friendly lot around here, even if it isn't a trailer park.